Is Coronary Calcium Scanning the Mammography of the Heart? If you have watched The Widowmaker as suggested by the skeptical cardiologist you have likely been convinced that the developers and promoters of coronary artery calcium (CAC) scans, for the early detection of heart disease, are true heroes in the cardiology world. These members of the “calcium club” are portrayed as unbiased self-less promoters of the prevention of heart attacks and sudden death, fighting an uphill battle against the evil procedure and money-driven forces who push coronary stents-greedy interventional cardiologists and the device, hospital and insurance industries. A constant theme in the documentary is that CAC scanning should be to the heart what mammography is to the breast. It should be done on all patients over a certain age and should be covered by insurance. As a non-invasive cardiologist with a strong interest in prevention, I am definitely a strong proponent of CAC scans in the right population. As the skeptical cardiologist, however, I find flaws with the mammography comparison. Let’s review some of the established science regarding CAC scans. Coronary calcium scan from a 52 year old man I was seeing for palpitations. He had had an equivocal stress test but had a strong family history of CAD. Standard risk factors were unremarkable. As shown here, he has very extensive calcium in his coronary arteries. 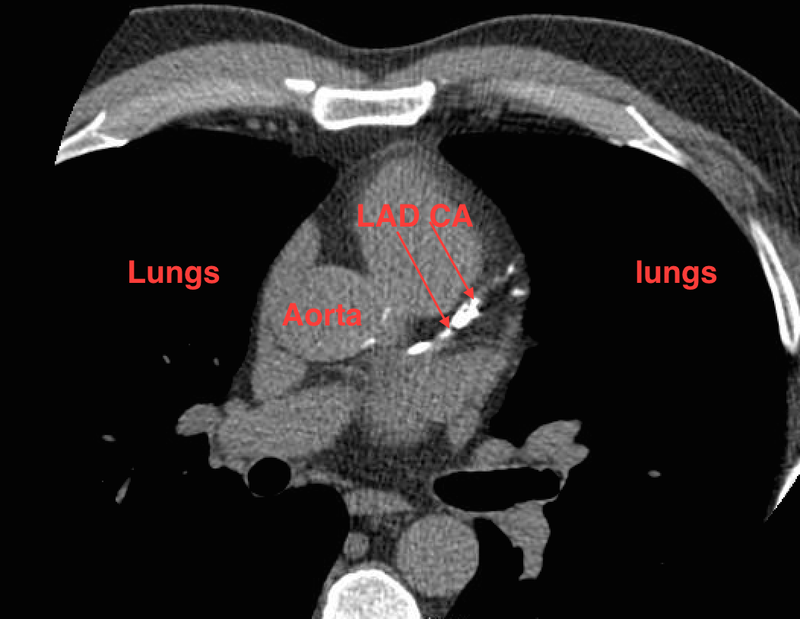 The left anterior descending (LAD) has lots of calcium (CA, indicated by arrows). His total score was 1798 which is at the 99th percentile for caucasian men his age. This means that his score is higher than 99% of caucasian men. Such a high score for age puts him in an extremely high risk category of heart attack and death. A preventive cardiologist, Dr. Arthur Agatson, who is interviewed in the film (and who is also the creator of the South Beach Diet, a low carbohydrate, high fat diet), developed a method for counting up the amount of calcium in the coronary arteries (the Agatson or calcium score). Calcium only develops in the coronary arteries when there is atherosclerotic plaque. The more plaque in the arteries, the more calcium. Multiple observational studies have shown that a high versus low calcium score is indicative of high risk for heart attack and death. For example, a large study published in 2008 (the MESA study), followed 6,814 individuals for 3.8 years. Compared with patients with a CAC score of 0, patients with a CAC score of 101-300 had a 7.7 fold increase risk of a coronary event (heart attack). CAC score of >300 conferred almost a tenfold increase risk. Based on data from 5 large studies and almost 15,000 patients, we can put patients with CAC score in very low to high risk categories for cardiac events over the next 10 years. What Is The Value Of A Zero Calcium Score? Just as important as identifying patients with advanced or premature atherosclerosis who should be getting intensive therapy for prevention of cardiac events, is identifying those patients who may not warrant therapy. …demonstrated that a zero calcium score confers this low risk of cardiac events for up to 15 years. Thus, many patients, who are considered intermediate risk based on standard risk factors, do not have significant plaque by CAC score and may not need otherwise indicated statin therapy. The comparison of mammography to CAC scanning is appropriate in that both have created considerable controversy and are at the epicenter of discussions on the value of mass screenings in the prevention of life-threatening disease. In contrast to CAC, mammography has been widely accepted and promoted by most professional organizations. In recent years, however, the value of mammography for all women over the age of 40 has been questioned. In 1980, a randomized controlled trial of screening mammography and physical examination of breasts in 89, 835 women, aged 40 to 59, was initiated in Canada. It was called the Canadian National Breast Screening Study. Recently, the Swedish Medical Board recommended that all mammography screening be phased out in that country. The US preventive services task force draft guidelines, updated earlier this year, will recommend screening for women aged 50-74 but not in those aged 40-49 years. -Over-diagnosis: finding and treating breast cancer that would not have been a threat to the patient. -False positives: the test identifies a possible cancer which is not subsequently confirmed. False positives lead to breast biopsies, which are not needed and often cause needless anxiety and stress. Is CAC Screening The Cardiac Equivalent Of Mammography? CAC scans differ fundamentally from mammography because atherosclerosis is a continuous and diffuse arterial process, whereas breast cancer is (most often) localized, and either present or not. The development of atherosclerosis starts with fatty streaks in multiple arterial beds fairly early in life, followed by progressive plaque development with progressive build up of calcium in the plaques. Thus, the CAC score ranges continuously from zero up to several thousand. The calcium score is not subject to false positives-if calcium is detected, atherosclerotic plaque is present. A mammogram is either abnormal, suggesting cancer and requiring a biopsy, or it is normal. There is no continuous grading of risk. The second fundamental difference in the two disease processes is that atherosclerosis can kill suddenly without warning. As pointed out in numerous examples in The Widowmaker, an individual can seem fit and hearty one minute, and be dead the next, from a heart attack caused by a lethal abnormal rhythm. Breast cancer deaths on the other hand, occur slowly after diagnosis, and are generally predictable. If we are looking for a cardiac test that has characteristics similar to mammography, the nuclear stress test is much closer than CAC. With a nuclear stress test we are using a radio tracer injected intravenously, which subsequently traverses the coronary arteries into the heart muscle. Subsequent imaging of the photons emitted by the radio tracer allows assessment of the status of blood flow down the coronary arteries. The test is designed to identify coronary arteries with flow limiting blockages (usually >70% blocked), caused by atherosclerotic plaques. Such blockages are more likely to be causing symptoms and therefore more likely to require treatment with coronary stents or bypass surgery. Like mammography, then, nuclear stress tests are either abnormal or normal, and when abnormal they can be falsely abnormal. Nuclear stress tests have a very high incidence of false positives. These false positives result in invasive catheterization procedures to more directly image the arteries, and may result in inappropriate coronary stenting or bypass procedures with associated risks. It is because of the high risk of false positives and attendant harm that in the last decade, all cardiac societies recommend against the routine use of stress testing in asymptomatic patients. As pointed out in the Widowmaker, there is no data which suggest that stress testing improves outcomes for cardiac patients. Stress tests by design tell us nothing about the noncritical build up of atherosclerotic plaque. You can have a normal stress test and have a huge burden of plaque in your arteries. It is this silent build up of atherosclerosis, with sudden rupture of plaque, which results in sudden death in most cardiac patients. What Is The Breast Cancer Equivalent Of CAC? A CAC of the breast would identify abnormal cells as soon as they began on the presumably multi-year road to becoming a full flown cancer. To be fully equivalent to the CAC, the breast CAC would have to have a proven treatment that could be instituted once a certain stage of cell transformation had been reached. For atherosclerosis, that treatment is statin drugs, which are recommended for those with high risk CAC scores. For breast cancer, the treatment of choice is mastectomy. Would Widespread Institution of CAC Screening Save Millions of Lives? Over a 10-year period, screening 10,000 women ages 50 to 59 years will result in 8 (95% confidence interval [CI], 2 to 17) fewer breast cancer deaths, and screening 10,000 women ages 60 to 69 years will result in 21 (95% CI, 11 to 32) fewer deaths. To scientifically determine how many lives are saved by CAC screening, we would need an extremely large randomized controlled trial lasting for at least 6 years. Individuals with low or intermediate risk from standard risk factors for atherosclerosis would receive a standard approach to management or would undergo CAC screening with treatment determined by calcium score. Such trials have been proposed but to date have not been funded by the NIH thus we may not have a definite answer for a long time. Should CAC Scans Be Covered Like Mammography? I am very conflicted on this question. On one hand I do believe that appropriate use of CAC scans prevents heart attacks and sudden death. How many, remains to be seen. As we saw for mammography, only large scale randomized trials will tell us for sure who will benefit and how much. On the other hand, I can see potential for abuse, and in the wrong hands, excessive downstream invasive testing, which will minimize the benefits of early detection. If CAC scans are covered by insurance and used widely, they could become a method for unscrupulous cardiology centers and doctors to proceed to unnecessary testing that would ultimately increase the amount of inappropriate coronary stenting. Indeed, it is quite ironic that the major theme of The Widowmaker, that of the medical-industrial stent complex suppressing CAC scan usage, is quite illogical, for widespread, injudicious use of CAC scanning would be a boon for stent inserters and makers. The inappropriate use of CAC scan information is limited currently because most of the doctors ordering them are primarily interested in prevention, not in generating more testing and procedures. The other limit on its use is cost. For 99% of my patients the $125 for a CAC scan at my hospital is not a limiting factor. On the other hand, in a less affluent population, this would be a large and limiting expense; the poor would be getting a lesser standard of care. The cases of patients in The Widowmaker who feel like a CAC scan saved their lives are very similar to those of breast cancer patients who feel mammography saved theirs. These patients often become passionate advocates for a specific test based on their own experience. The Widowmaker, in fact, was funded by David Bobbett, an Irish millionaire who discovered that he had an extremely high calcium score and now feels like everyone should get the test. Bobbett is convinced that the test saved his life, but all anecdotal patient stories about CAC scans “saving their life” have to be taken with a grain of salt. After this (far too long) discussion I have to conclude that although they share many features, CAC scans are not the mammography of the heart. Excellent review. I will share. I am 57 had a zero calcification score 1 year ago all areas all lobes quadrants of heart. I just had an abnormal stress test my doctor wants me to have A Coronary CCTA at Marquis Diagnostics Gilbert, AZ later this week. My blood pressure is mostly normal and sometimes borderline high. I don’t have any shortness of breath and can work out walk hills etc. go all day hard without being tired. I am a little confused and will remain patient but was wondering if you have any insight? My family father and brother had issues at my same age but I have lived a pretty healthy lifestyle overall and not overweight or a bad eater lack of exercise like they were?? Taking statins increases CAC while reducing plaque, apparently. My husband received a zero on his calcium scoring. Three years later he had a ST Elevated Myocardial Infarction. We called 911 immediately in a rare spurt of common sense and he’s fine with no significant damage to his heart. As our cardiologist said, ” the calcium scan might tell you if there’s plaque at that moment, but it doesn’t show who is a plaque maker”. Probably foolish to consider it an oracle of indisputable fact. I’m glad things turned out well despite the STEMI (heart attack)! You are correct, although the zero score puts you into a very, very low risk category over a ten year period, the risk is not zero and if you’ve gotten a zero calcium score you should not consider yourself “immune” to cardiac problems. It is a much better way of assessing your risk than cholesterol levels and evaluating standard risk factors. Very early plaque is “soft” and has not had time for calcium to deposit which seems to be more of a healing process occurring on fatty plaques. These “soft” plaques are more worrisome for acute rupture and sudden heart attacks and death. We dont have good ways of identifying these at present. Most excellent information! Thank you, Doctor!